Published: Sat, July 27, 2013 @ 12:09 a.m.
More than 15 public-advocacy and activist groups will gather Monday in the city for an anti- fracking rally that the organizations say is expected to draw hundreds of people. The rally will take place at Courthouse Square in the city’s downtown beginning at 11:30 a.m. Speakers from several organizations are expected to discuss the growing concerns that “Ohio has been targeted by the oil and gas industry for disposal of waste from hydraulic fracturing, or fracking,” according to a press release about the rally. Organizers also will call on the state’s lawmakers and Gov. John Kasich to ban underground injection wells and caution against the dangers of naturally occurring radioactive materials in the waste. Among the rally organizers and participants are the Ohio Buckeye Forest Council, Frackfree Mahoning Valley and Progress Ohio. Other notable organizations include Appalachia Resists, which shut down a waste storage and transloading facility owned by Texas-based Green Hunter Water LLC in Washington County in February. Ten of the group’s members were arrested at the facility for their opposition to the company’s proposal to barge fracking wastewater up the Ohio River. Bill McKibben, a nationally renowned environmental activist and co-founder of the participating organization 350.org also is expected to be on hand. In February, McKibben was arrested in Washington, D.C., with a host of others, including celebrities, who tied themselves to the White House gate to protest the Keystone XL oil pipeline. The most recent data, released by the Ohio Department of Natural Resources, shows 14.2 million barrels of fluids and other waste from fracking were disposed in the state’s 191 injection wells in 2012 — a 12 percent increase from 2011. 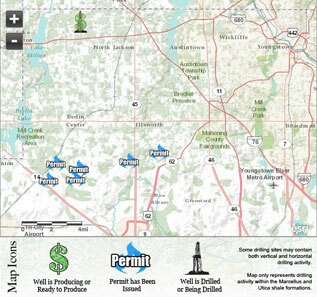 But some geologists and those in the oil and gas industry say Ohio’s rock formations and its laws and regulations are uniquely suited to accommodate and deal with the waste. Training for registered participants in “nonviolent direct action and group dynamics” and informational sessions about the fracking process and injection wells started today in Ravenna.